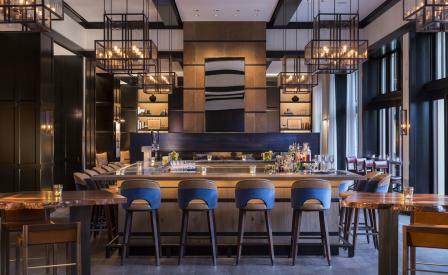 With the northern ski-season just about to kick-off, the Remedy Bar at the Four Seasons Resort in Vail has, with impeccable timing, emerged from a $2.5m spruce up by the New York-based Meyer Davis Studio. It helps that the bar already commands an impressive vista of rugged Coloradan mountains that are perfectly framed by high windows that run the entire length of the room. The bar itself has been repositioned so that it is now, literally, the centre of attention with space on all four sides to gather, network, and people-watch with careless impunity. Leather panels, oil-rubbed bronze bands, Moroso chairs in light grey fabric, tan leather chairs, a polished zinc bar top, and marble side tables impart a mood-lit vibe that is modern but without being clinical. Meyer Davis put just as much thought into the wall art, picking abstractions of the traditional American Wild West such as an impressionist take of an eagle, and a black and white triptych of a mountain peak. Take it all in with a pizza topped with foie gras, pear and gorgonzola, finished with a bourbon, maple and bacon ice-cream sandwich. And if none of that impresses, there’s always a sports programme to cheer to on the 165-inch television screen.